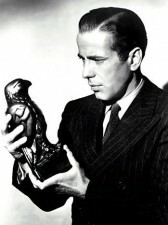 The Maltese Falcon statue from the movie of the same name, which starred Humphrey Bogart, sold at auction for $4,085,000, including a buyer’s premium of $585,000. The sale was conducted by Bonhams in New York in conjunction with Turner Classic Movies. It ranks with the most expensive pieces of movie and TV memorabilia ever sold at auction, trailing the original Batmobile from the 1960s TV show, which sold for $4.6 million, and the Aston Martin driven by Sean Connery as James Bond in “Goldfinger,” which sold for $4.1 million.